The Sentinels of the Tomb of the Unkown Soldier hold among the most revered posts in the U.S. armed forces, so it makes sense that they should have a sidearm to match. Sig Sauer will present a cache of four specially-designed 9mm M17 pistols to Tomb Guard Platoon of the Army’s 3rd Infantry Regiment (The Old Guard), the company announced on Oct. 3. 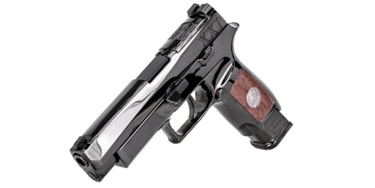 Created to the same specs as the M17’s adopted as part of the Army’s Modular Handgun System and fielded to soldiers earlier this year, the ceremonial M17 Tomb of the Unknown Soldier Pistols are distinguished by a stainless steel slide and a custom wood and aluminum grip. More importantly, each of the four pistols will have a unique name: Silence, Respect, Dignity, or Perseverance. The names are tributes to the special mission of the Old Guard. the Archives of Never Yet Melted in the 'Sig M17' Category.